Enjoy three times the beauty of the Samurai way with this three-piece sword collection complete with a wooden display stand. 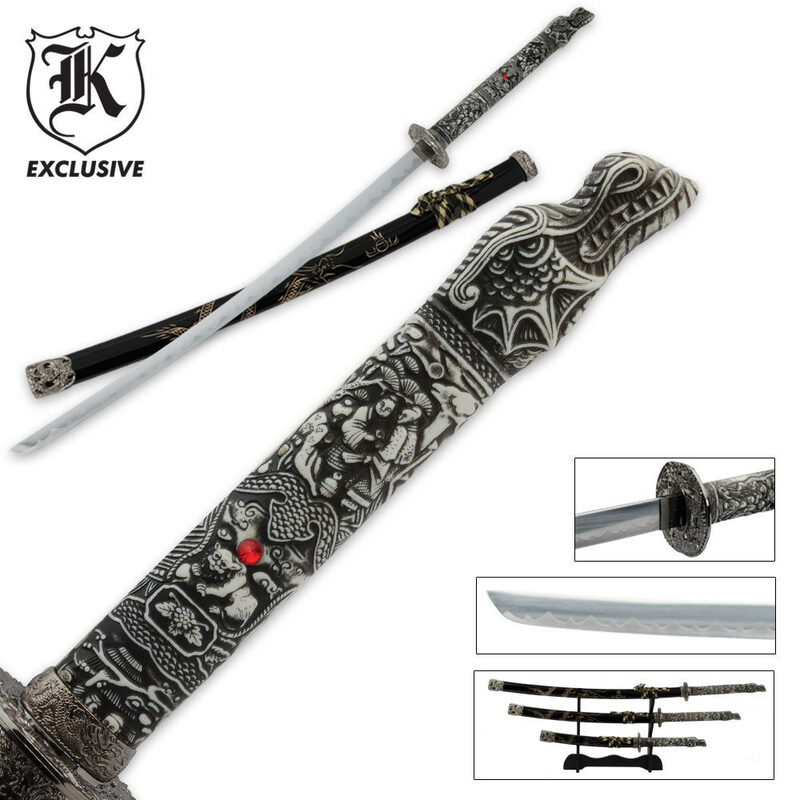 This three-piece collection includes a traditional katana, wakizashi and tanto, all featuring stainless steel blades with intricately designed faux ivory dragon head handles. A matching scabbard houses each blade. The handles look very cheap and when I got them they all had some hairline cracks on them. Plus on the picture in catalog and website they have more black than white which makes it look nicer but the ones I got mostly white. Received this as a gift and as the response to the other poster mentioned this set is strictly decorative. It's not full tang, the handle appears to be resin, the tsuba and fittings on the saya are plastic and loose fittings. There is nice detail all around and the blade is carbon steel so it's by far not the worst I've seen. But yeah, purely decorative. I'd honestly spend the money on a better quality single sword you can actually show off to friends. Response: Hello Sami, This 3 piece Dragon Samurai Sword Set is not full tang. The product was made with the intentions of it being a display or decorative piece. Thank you for taking the time to comment. Happy Holidays! These were very nice to display in the nook of the kitchen on a small table. Friends compliment them. However, the pieces on the tips are plastic and we had to glue them back on. It did not effect the look at all.